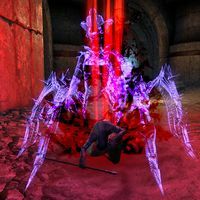 Anexiel is a Spider Daedra at Nilata Ruins who serves Mephala. When Najan accidentally stumbled across her talisman, she took on the form of a beautiful spirit and seduced the goat farmer until he was willing to bring his wife—Adeena to her to use as a vessel. Once Anexiel possessed Adeena, Najan had second thoughts and enlisted the help of his wife's mage sister Izzara, who needs help to stop the Spider Daedra from completing its' summoning ritual to fully incarnate on Nirn. Anexiel: "Ah, bravo, mortal! Your powers of perception are strong indeed! Unfortunately, twins share the same blood! How vexing! Pity I didn't think of it sooner, it might have saved us all a great deal of talking." Anexiel: "Oh, what an unfortunate miscalculation! Five innocent deaths on your head in as many minutes... I do hope you remember to say your prayers tonight!" "The ritual is complete! And my first act will be to reclaim my body and destroy you!" Anexiel: "Oh, yes... Come meet your sweet demise, mortal." Anexiel: "Lie still, my sweet. It will all be over soon..."
This page was last modified on 30 November 2018, at 11:02.